441, Lot: 229. Closing Apr 03, 2019 at 11:16:20 AM ET. SASANIAN KINGS. Šābuhr (Shahpur) I. AD 240-272. Æ (26mm, 10.97 g, 1h). Uncertain mint. Phase 1a, circa AD 240-244. 441, Lot: 245. Closing Apr 03, 2019 at 11:21:40 AM ET. SASANIAN KINGS. Yazdgird (Yazdgard) III. 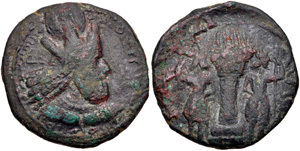 AD 632-651. Æ Chalkous – Pashiz (12mm, 0.80 g, 7h). 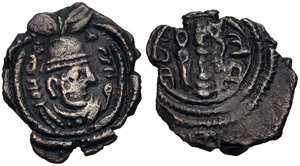 ART (Ardaxšīr-xvarrah) mint. Uncertain RY date.